For many people around the world, New Year’s Resolutions are usually broken within days (if not minutes) of them being made. This is usually due to the fact that we either set too difficult a goal to achieve, or we don’t really commit to it in the first place. In 2014, I’m inviting you, the Australian Golfing Public, to join me in a simple “Group Resolution” to help grow the game of golf. While golf’s governing bodies are all working behind the scenes to grow the game, the onus is really upon us, the large community of Australian golfers, to make it all happen. If we want golf to grow, we all need to do something about it. It’s all but guaranteed that each of us has, among our vast communities/networks, at least a few friends who would be keen to have a hit. Whether they’re from work, school or even in our neighbourhoods, we can all find someone to introduce to the game. Alternately, this same pool of individuals could have heaps of closet “golf tragics” who, for some reason or another, haven’t found the opportunity to play the game lately. So why not invite one or more of these people to your club for a hit? If you’re a bit more creative, maybe initiate a twilight/9-hole mini “Golf Day” among work colleagues or your mates? 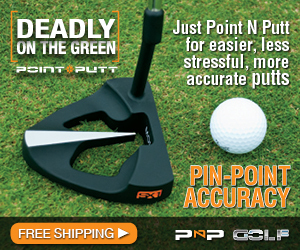 Or a simple hit at the range (maybe your club Pro could offer a group clinic). Anything to get people swinging a golf club. Trust me, this is easier than you think, and it will pay huge dividends in the long run. So get out there and ask! Juniors are the future of our clubs, plain and simple. And there has never been a better time to help get juniors into the game: Adam Scott is becoming an inspiration to a whole new generation of potential golfers out there, and they are chomping at the bit to follow in his footsteps. We just need to get them on to the course. 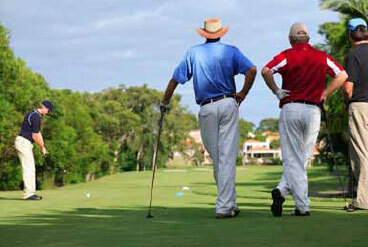 Golf is a very healthy endeavour (read our “How far do you walk when playing 18 holes” online series.) It is also a tremendous way to boost concentration and mental activity, while also encouraging honesty, integrity, discipline and a host of other great qualities. Best of all, it’s just plain fun. If we can get the word out, on a grassroots level, about all the benefits of golf to the younger generation, we will help ensure the future of our sport. So: what can YOU do to get juniors more involved at your course? Here are a few ideas: Take an active role at your club to get juniors involved. Volunteer some time to help promote a clinic. Help start a caddy program. Work with the Pro/Club to initiate a Junior Open Day. Get some local schools involved in a mini competition. Or simply invite a junior to play a round with you one day this year, and make them feel welcome! If all else fails, ask fellow players for their ideas. It’s generally accepted that slow play is killing golf. It is one of the barriers to getting new players into the game, and it is also a large culprit in driving some current players away. There are many little things we can all do to combat this, and help dispel the public notion that “golf takes too long”. At my club, for example, there is a hole that is adjacent to the driving range (which uses white balls). Many players’ wayward tee shots can end up near the range, and it can take quite a while to identify a played ball among the sea of white range balls. One simple solution: I tee off with a neon yellow ball for that hole, just in case I hit it near the range. Even if it saves five minutes of searching, it’s worth it. A few other players at the club are now doing the same. At every course in Australia, there are small things like this that we can all do to help speed up the game. Other areas where we can help combat slow play: If players are constantly searching for balls in the rough at your course, encourage the club/committee to reduce the length of the rough a bit. Finding a ball will be much quicker, while the penal aspect of the rough won’t be affected by that much. Of course, all the old standbys are still helpful: Play ready golf when possible. Plan your shot/putt BEFORE it’s your turn. Place your buggy/cart at the exit of the green. Watch every shot until the ball stops rolling. Always play a provisional if there is even a slight chance of not finding a wayward drive. Keep up with the group in front of you. If sharing a cart, drop off one player at their ball, then take the cart to the next ball while the player plans their shot, etc. There are dozens of ways to speed up play. Of course, there are heaps of things we can all do this year to give back to golf. But if we all team up together, and each achieve (at least) the three things outlined above, it will make a measurable difference. It all adds up. And golf will be the winner.